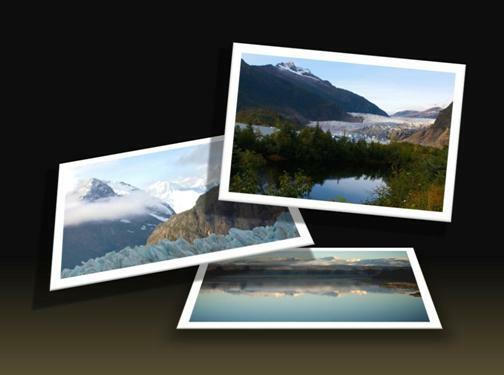 A PowerPoint photo album is a presentation that you can create to display your personal or business photographs. You can either download PowerPoint Photo Album Templates from Office.com, or you can create your own. 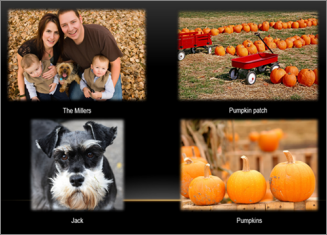 A PowerPoint photo album is a presentation that you can create to display your personal or business photographs. If you want to create your photo album from a pre-made template, you can search for one in the search box labeled Search for online templates and themes and choose whichever one you like. Go to Insert and click the arrow under Photo Album, then New Photo Album. 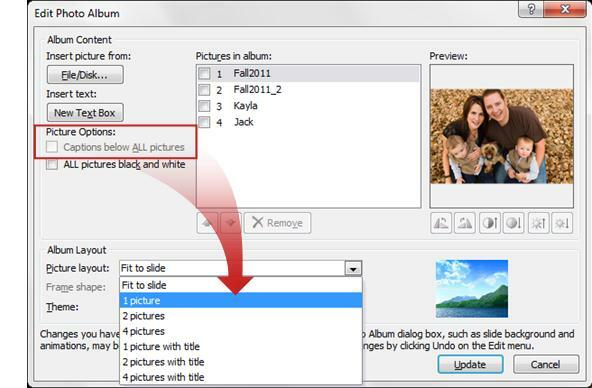 In the Insert New Pictures dialog box, locate and click the folder that contains the picture that you want to insert, and then click Insert. Open the photo album presentation. On the Insert tab, in the Images group (Illustrations in PowerPoint 2007), click the arrow under Photo Album, and then click Edit Photo Album. Under Picture Options, select the Captions below ALL pictures check box. If the Captions below ALL pictures check box is grayed out or unavailable, you must first specify a layout for the pictures in the photo album. To specify a layout for your pictures, under Album Layout, in the Picture layout list, select the layout that you want. In Normal view, click the caption text placeholder, and then type a caption that describes the picture. To select a theme for your photo album, under Album Layout, next to Theme, click Browse, and then in the Choose Theme dialog box, locate the theme that you want to use. To rotate a picture clockwise, click . To increase the contrast, click . To decrease the contrast, click . To increase the brightness, click . To decrease the brightness, click . There are a few different ways you can share your photo album with others. Click Insert > Photo Album > Edit Photo Album. Under Pictures in album, select the picture, and then click Remove. If you don't want to create your own photo album, you can find free, pre-made photo album templates on Office Online. To learn more about using themes, see Apply a theme to add color and style to your presentation. A PowerPoint photo album is a presentation that you can create to display your personal or business photographs. You can add effects that include attention-grabbing slide transitions, colorful backgrounds and themes, specific layouts, and more. After the pictures are in your album, you can add captions, adjust the order and layout, add frames around the pictures, and even apply a theme to further customize the look of your album. To share your photo album with others, you can send it as an attachment to an e-mail message, publish it to the Web, or print it. On the Insert tab, in the Illustrations group, click the arrow under Photo Album, and then click New Photo Album. If you want to preview a picture file in your photo album, under Pictures in album, click the file name of the picture that you want to preview, and then view it in the Preview window. 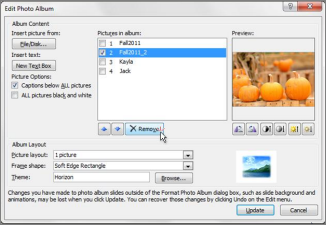 To change the appearance of the pictures in your photo album (including specifying a layout, adding a frame to your pictures, selecting a theme, and inserting a text box), see Change the appearance of a picture. On the Insert tab, in the Illustrations group, click the arrow under Photo Album, and then click Edit Photo Album. To select a layout for your pictures, under Album Layout, in the Picture layout list, select the layout that you want. To add a text box (which provides spacing in your photo album), under Pictures in album, click the picture that you want a text box to supplement, and then click New Text Box.